I've been putting the finishing touches on Vogue 8615, the pattern with which I've been demonstrating tissue-fitting. I'm making it in a lovely wine-colored silk shantung that makes the most delightful rustling sound when I walk. (Sneak peek above! Excuse the wrinkles please. Lesson learned: shantung is tricky to press!) But I wasn't even midway through that project before I was obsessing about the ones to come. I think all this scattered-mindedness might be the result of working so long and diligently on just one project. That was great and all, but now I want some instant gratification. And lots of it, please! Preferably, in the form of a whole new wardrobe of office separates. Isn't the suspender version on the left incredible? Can't you just see it in something black and stretchy? Maybe paired with a bow-tied blouse? Don't try to convince me that a 30-year-old woman shouldn't be wearing suspender skirts that were marketed to teenagers sixty years ago. I won't listen! 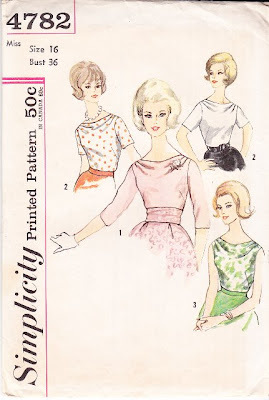 Also, a lovely reader named Lee Ann sent me this blouse pattern and I'm dying to make it. Don't you love the cowl action? And another lovely reader, Sarah, sent me this one. (You guys are so sweet to me!) Check out the awesome high-waisted skirt. Okay, I better stop or I'll be here all day. But don't think I've forgotten the Vogue's New Book for Better Sewing project! (As you may recall, I took a little break once I reached the half way point.) In truth, I've also been scheming about old VoNBBS quite a bit. I think I've come up with a good way to shake it up . . . details to come! Oh, I so understand what you're saying about working hard with one project, and then dying for something easy and instant enjoyment! That's why I never seem to manage to stick to one project at the time. The pencilskirt in the last pattern looks great! And so does the picture of the dress! Every waking moment...I'm scheming, planning and dreaming about what to sew! I'm with Carolyn - every waking moment. Some of the sleeping ones, too! We all feel your pain. When I'm lying in bed with my boyfriend and getting ready to to sleep, he asks me what I'm thinking of (poor chap clearly wants some attention). The answer is "Dresses". Not much changes when I wake up, I just pick it up where I left it. When I walk to school and take a bus. I think of collars and sleeves, bow-shaped drapes and high corset-like belts, I think of soft velvet in deep blue or black, a crispy silky cotton flowery perfection, of grey wool of top quality that will make the dress have it's own shape and all the billion interesting cuts that will just make the outfit. And when I'm too frustrated I go through my archives of photographs that is covering most of the 50's, 60's and 00's. Oh no, you are SO not alone! What everyone else said. What's particularly difficult for me is that the shelves of my approx 1,000yds of fabric stand just behind my computer, so that while I'm trying to work on my thesis I keep getting distracted - for some reason. The suspender skirt is FANTASTIC! I think you should make it next! ooo, pretty dress. Question: what is the difference between shantung and dupioni? Well, until recently all my sewing dreams were about quilts ... hadn't made much in clothing for myself since I was about 30 :-) But a former colleague gave me her amazing fabric stash earlier this month, so now I'm dreaming of wool pants with coordinating jackets, sheath dresses, capris and summer shirts, and a scallop-front suit from a 1940s pattern I picked up on Etsy. My dining room table is covered with swedish tracing paper and my house is getting dusty, lol! Anyway... *ahem* I'll stop rambling. I love all the patterns you posted; especially that pencil skirt with the suspenders! (That's another style that is one my wishlist right now! ;) I think you'd look fab, Gertie. It's sassy and cute--you pull off both beautifully. Can't wait to see the shantung dress you're whipping up too--the fabric is making me drool! I am absolutely going to make mine, and you should definitely make yours. It's fabulous - the high waist is very now, but the straps make it funky and a vintage shirt will make it vintage classy. I have a real thing for pinafores - somehow I feel extra secure in them, as if nothing bad can happen to me because I've got straps and a bib as well as a skirt. Is this just me or has anyone else experienced that? It's very comforting to hear that I'm not the only one! 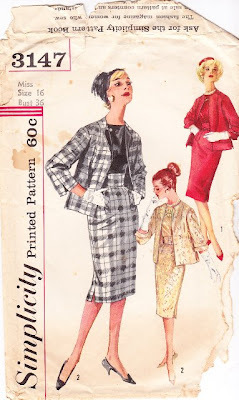 Looking forward to you doing that top skirt pattern, Gertie, as it's one I have on my list. And your new dress project looks gorgeous, as always! I can sew relate. I have lost lots of sleep dreaming of future sewing projects. I would only try to convince you that a 30-year-old woman should indeed be wearing suspender skirts that were marketed to teenagers sixty years ago! They would look so cute on you! Oooooooh, love the inspiring patterns. The blouses (esp. the cowl-neck) are making me drool! They'll look great with your amazing coat. Good to see the next set of things coming after a big undertaking like the coat. I'm excited because I know you'll go flying through projects again and sew far more things than I could imagine! The suspender-skirt is awesome, though - I've half a mind to find a pattern for myself and start on it once finals are over! Can't wait to see what you do next. Whatever you make is always lovely, well crafted, and inspiring! I completely understand about the feverish sewing dreams - the other day, I thought so much about all the things I wanted to do, that I couldn't go to sleep at all, my heart was beating so much, almost out of worry! I utterly adore that cowl top pattern, I've been searching for one like it for ages but there doesn't seem to be anything in contemporary patterns available :( does anyone know of one? I think I too could use some quick projects! I didn't get a chance to comment on your coat post, so I'd like to say here that it's STUNNING. See, this is the problem... fab patterns + gorgeous stash = insomnia, and no one ever warns you about that!! Something I did before the holidays, was draw up little pictures of me wearing the patterns I either owned, or wanted to own, and matched it with different fabrics I had from the stash. It was like a visual build-a-wardrobe, and was really helpful to me to see it all laid out and see what I really wanted, and what was a bit of a fantasy (like do I really need yet another black shirt?? Jersey skirt??) etc etc. I so know about scheming! I have two huge projects and two small ones all ready for me to work on and I keep buying more fabric to make more things! I need to get one done for my daughter's birthday (Feb 2nd!) I am making her a bed set and only have the fitted sheet done. I tend to get so excited about my next project that I have a hard time finishing the project I am working on! Like everyone else, I too think about my projects all the time, I get so excited that I can't sleep and my sewing room is a few steps away. It is so tempting to get up and just pull an all-nighter, but that 6:30 wake-up call comes way too fast and I have to resist the urge. i obsess too! i write lists and have a book filled with sketches for patterns i want to draft. Glad to know I'm not the only one - LOL. I am drooling over your gorgeous new patterns. Love the second one with the cowl - sensational! I like planning before falling asleep... It's soothing. I can let go of any stress from the day, lose myself in patterns, textures and coordinating fabrics. Sometimes I run up against a brick wall in my sewing, I think about those conundrums before sleep as well. Often just before I nod off or the second I wake up I'll have an epiphany. I'm into sewing dresses right now, I burnt out on wardrobe separates last fall with the PR contest... Dresses cotton, dresses silk, graphic print dresses, shimmery blue wiggle dresses. Piping, lace trimmed skirt linings and side zips all over the place. Le swoon. And also some linen shirts for the Man. Your dress is beautiful. I watched your vlog on tissue fitting and it looks like your dress is completed. Great job. Yes, you are not alone...generations of us have been obsessed about fabric, patterns and what to make when, how and now! Absolutely, scheming all the time! 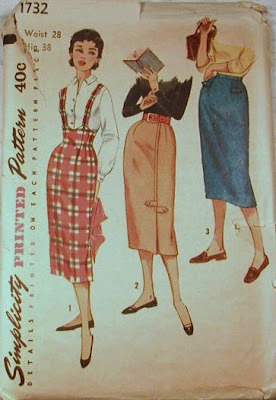 I particularly covet that high-waisted skirt in the last pattern, but I would LOVE to see that suspender skirt made up! And of course little cowl-necked blouses are indispensable. Oh, and I'm still drooling over that skirt (I think it was a suit but I remember the skirt especially) from Blue Gardenia! OMG the dress you are making?! I cannot wait to see it! I echo all the other commenters - I am constantly thinking about what I'm working on or what I'd like to sew. Some nights I can't fall asleep because of it! I feel so much better that I'm not alone. Fun post.